Emmanuel Macron will be in Tunisia this week where the French president is expected to address parliament, attend an economic summit, and hold discussions on trade and security cooperation between the two countries. 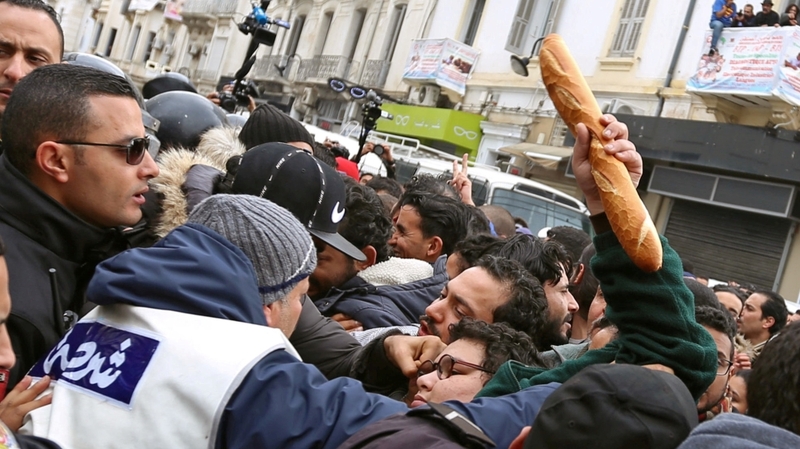 But analysts say Macron's visit is unlikely to have a meaningful impact on the challenges facing the Tunisian economy, a situation that pushed thousands of Tunisians onto the streets this month to call for an end to austerity measures. Macron's visit on Wednesday and Thursday marks his first official trip to the country since he became France's president in May 2017. "There will be a lot of words, but I don't think we should expect any big revolutionary investments in the country," said Youssef Cherif, a Tunisian political analyst. A former French colony until it gained independence in 1956, Tunisia views France as its "traditional and natural partner", Cherif told Al Jazeera. The two countries share a common language - a legacy of French colonialism - and have maintained strong ties on trade, culture, security and political issues. Hundreds of thousands of Tunisians live, study and work in France, and tens of thousands of French citizens, many of whom are dual French-Tunisian nationals, also live in the North African nation. But "the relationship is not equal at all", Cherif said. "We have France, a big and rich country, and Tunisia, a smaller and poorer country ... and Tunisia would benefit from having strong partners other than France in order to diversify its ties." France was the second-largest investor in Tunisia in 2016 behind the United Arab Emirates, and invested about $1.7bn into the country, the French foreign ministry said. How can Tunisia rebuild its economy? France has also traditionally been Tunisia's largest trading partner within the European Union. Tunisian exports to France totaled $4.3bn in 2016, or about one-third of all exports, while bilateral trade surpassed $9bn that year, the ministry said. But Tunisia's debt to France is sizeable, amounting to $1.6bn in 2016. That accounted for 50 percent of Tunisia's bilateral debt - direct debt between a single lender and a single borrower. Cherif said he believed Macron will convert some of that debt into investments this week. During his two-day visit, Macron is expected to speak in front of the Tunisian parliament and meet his counterpart, Beji Caid Essebsi. 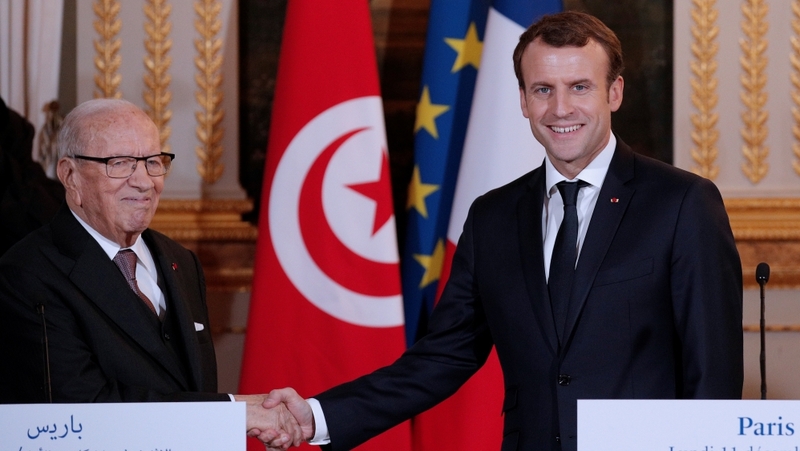 On Thursday, the French president - who will be accompanied by several businessmen and government ministers - will also attend the inaugural Tunisia-France Forum on economic relations. The Tunisian economy has been in the spotlight this month after anti-austerity protests broke out in cities across the country. Under the slogan Fech Nestannew (What are we waiting for? ), protesters have called for the government to scrap a budget law for 2018 that raised the price of basic goods and value-added taxes on citizens. Many Tunisians are also calling for an end to corruption and privatisation and for young people to have greater access to public sector jobs. Nejib Mohamed, communications director of the Tunisian-French Chamber of Commerce and Industry, which organised the economic forum, said Tunisian business leaders are hopeful Macron will announce new investments. Those can "create wealth" and lead to more local jobs, Mohamed told Al Jazeera. "If international groups invest in Tunisia, that's a vote of confidence in the country," he said. During a visit to Tunisia last October, Edouard Philippe, France's prime minister, signed business deals worth more than $100m in several fields, including agriculture, renewable energy and education. Asked whether he believed Tunisian businesses were adequately helping the country deal with its current economic problems, Mohamed said companies "have a mission to contribute to the creation of wealth and jobs" in Tunisia. Sarah Yerkes, a fellow in the Middle East programme at the Carnegie Endowment for International Peace, said people should not have false hope that Macron will solve Tunisia's economic problems. "There's already this massive expectations gap problem in Tunisia; people have not gotten from the revolution what they've expected to," she said. More than seven years after a popular revolution toppled longtime president Zine El Abidine Ben Ali, many Tunisians say the economy is worse than ever before. Unemployment sits at about 15 percent, and among youth around 30 percent. "That's where I would be a little bit worried, if people think that Macron is going to come in and save the day and he doesn't," Yerkes said. She said she expected migration to be a point of focus during Macron's visit, as well as security, including cooperation and training to secure the porous Libya-Tunisia border. "With Libya next door, I'm sure there will be some discussion about that kind of security cooperation." Tasnim Abderrahim, a Tunisian researcher at the European Centre for Development Policy Management, told Al Jazeera the focus of Tunisia's international partners has shifted strongly towards security since a string of violent attacks took place in the country in 2015. "In terms of security, you have the fight against terrorism, counter-radicalisation and then border security with Libya," she said, explaining Libya has become a major focal point for France and the European Union, which are seeking to stem the flow of asylum seekers attempting to reach Europe. "The EU describes Tunisia as the exceptional experience, as the unique experience, as the democratic model, and then Tunisian officials say we want more concrete action to match this rhetoric," Abderrahim said. The visit also comes after the EU removed Tunisia from a blacklist of countries it designated as tax havens. The country had been added to the list in early December for allegedly being host to "harmful preferential tax regimes". The United Arab Emirates, South Korea, Bermuda and others were also taken off the list at the same time. But the EU did not explain what steps Tunisia or any of the other countries had undertaken since December to warrant their removal. Tunisia now figures on a grey list of tax havens. According to Cherif, being on the list has put "a lot of pressure on Tunisia" because of its current economic crisis, and as it is about to go back to negotiations over a free trade deal with the EU. "Putting Tunisia on that list gives Tunisia less power or less leverage in negotiating that free trade agreement with the EU," he said. According to Abderrahim, the Tunisian government fears the designation will draw "away investments that Tunisia really needs for its economic recovery". She said the government in Tunis wants support from France on its socioeconomic development, as well as at the EU level. It wants Tunisian citizens, especially young people, to get visas to European countries more easily. But while the Tunisian government has high expectations, most citizens do not. "What Tunisians want is more from their government and not much from their international partners," Abderrahim said. For that reason, she said Macron's visit will be "just business as usual". "It will be conventional diplomacy and the official discourse and joint statements... I do not really see something extraordinary coming out of this visit."